PITTSBURGH (AP) — A former high school student testified Thursday that he did nothing wrong before three Pittsburgh police officers arrested and assaulted him in 2010 as he was walking to his grandmother's house. Jordan Miles, who is black, alleges in a federal civil rights lawsuit that the white officers wrongfully arrested him and used excessive force. Miles testified that the officers, who were in an unmarked car, didn't identify themselves and that he thought they were muggers when they rushed at him at about 11 p.m. He said he had never before been arrested, played the viola in school and was an honors student. Miles' attorney introduced pictures taken at a hospital after the arrest that showed his face swollen almost beyond recognition and said examinations showed he could have been hit 14 times in the head. The officers acknowledge kneeing Miles repeatedly and punching him in the head, but they said that was all necessary to keep him from reaching for what they believed was a gun. After the arrest "it hurt to move just about every part of my body," Miles said. The two sides disagree about almost every aspect of the encounter, and there were no independent witnesses. The officers, Michael Saldutte, David Sisak and Richard Ewing, say many of Miles' facial injuries occurred when he was tackled by Sisak and driven through a shrub, head-first. Miles has insisted he was never driven through the bush and has said the officers ripped locks from his head. Police said Miles had a bottle of Mountain Dew in his pocket that looked like a gun, but Miles said he didn't and never even drank the beverage. Miles also said he agreed to a drug test at the hospital because he never used drugs. The test came back negative. The officers also claim Miles elbowed Saldutte and kicked Sisak in the knee, but Miles said he never struck them. During cross-examination in the afternoon James Wymard said that some of Miles' descriptions of events have changed or grown fuzzy over time. For example, he originally described the unmarked police car as white, but it was brown. Miles said he was confused and scared during the arrest and subsequent assault, and isn't sure about some details. A district judge said he didn't find the police version credible and dismissed all criminal charges against Miles. An FBI investigation resulted in no criminal civil rights charges against the officers. Miles' lawsuit was heard by another jury two years ago, which cleared the officers of allegations they prosecuted him maliciously. 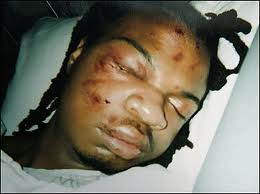 But that jury couldn't decide the excessive force and wrongful arrest claims that are the focus of the current retrial. Miles said that he felt confused and "helpless" at the jail. "I didn't do anything wrong," he said. Judge David Cercone sent jurors home early on Thursday afternoon. The trial was scheduled to resume Monday.